Although States have been available in Glue for a long time (about as long as Variables themselves), they have fallen out of style in modern FlatRedball development. 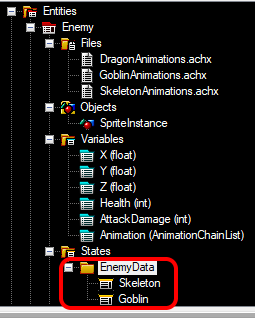 Meanwhile the feature set for CSVs has continued to advance, and this file format has become the preferred way to define game data and to organize variables. Developers who wanted to define and organize variables had to choose which set of benefits were more important…at least until today! The latest version of Glue ships with a new embedded plugin which I’m calling State Data. This name was selected to suggest a system that combines the best of states with CSV data. Notice that whenever a new row is added, a new state appears under the category. 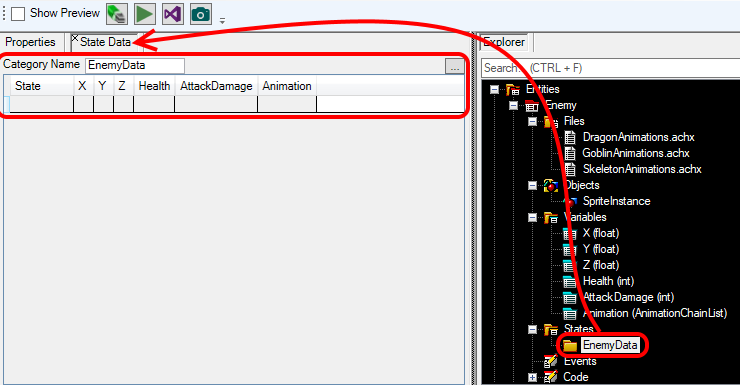 And as mentioned earlier, values which have discrete options appear as dropdowns. 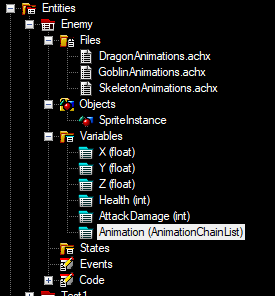 For example, the Animation variable displays available .achx files. By default state categories include all variables. This is convenient for quick state creation, but sometimes entities define variables which should not be in a state. 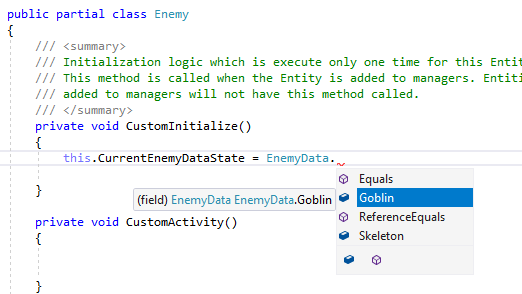 The State Data plugin introduces the ability to exclude variables from states. 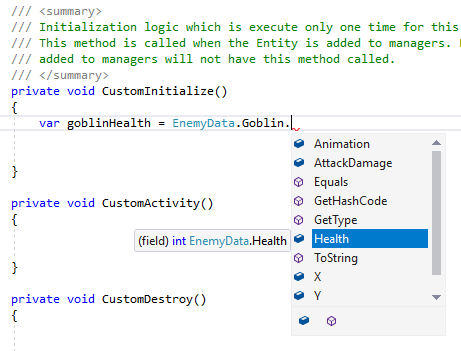 The … button can be clicked to expand the variable management UI where variables can be excluded from a state. In this case, the X, Y, and Z variables should not be part of the EnemyData. And once a state is assigned, all variables are automatically applied to the entity; there’s no need to write variable assignment handlers and hookup (like is necessary with CSVs). While most code will work the same as before (such as assignments and comparisons), a few things will no longer work and may require you to manually change your custom code. Switch statements require const values, and could be used with the old implementation of states since each value was an enumeration. Since each state is now an instance of a data class, switch statements are no longer allowed. Therefore, switch statements need to be converted to if/else if statements. The previous implementation of states provided an Undefined value for all states. The new implementation allows null values. Therefore, any checks or assignments using Undefined should now use null instead. This may change in future versions of Glue, but currently states are not shared across base and derived classes. Therefore, if you assign a state on a base entity, the derived entity may still have a null value for its same-named state. As this feature settles and is used more internally, it may evolve to support shared states across inherited entities. State Data as a CSV Replacement? At this point it’s too early to say whether state data will replace CSVs. This first release introduces some much-needed features, making states once-again relevant for game dev, but they will need to continue to expand to completely replace CSVs. I expect that State Data will continue to grow over the coming months, adopting more features from the already-mature CSV technology. 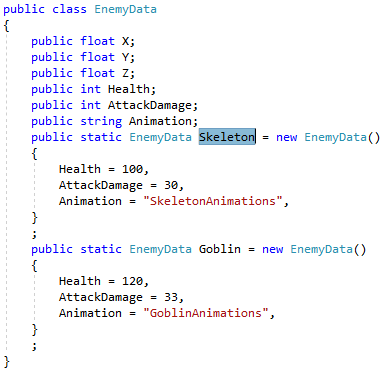 The current version of Glue fully supports everything you see above, so if you’re looking to define data for your game, a simple Glue update is all you need.